The journey from my office in Colorado Springs to Lovell, Wyoming near Cloud’s home in the Pryor Mountains, is a long drive—about nine and a half hours. Spotting wildlife along the way makes the time pass. I enjoy seeing herds of elegant pronghorn antelope and the occasional golden eagle. The rare sighting of a coyote or a wintering bald eagle is exciting, but nothing I spotted in the past year surprised me as much as seeing a band of wild horses! Past the town of Greybull, Wyoming and about 20 miles from Lovell, I saw them for the first time. It was June 22, 2013. I pulled off to the side of the road, grabbed my binoculars and began glassing. They were grazing peacefully in front of the only trees I could see for miles. I counted 12 including two foals and assumed that the larger black horse with a blaze was the band stallion. He looked like quite a handsome fellow. 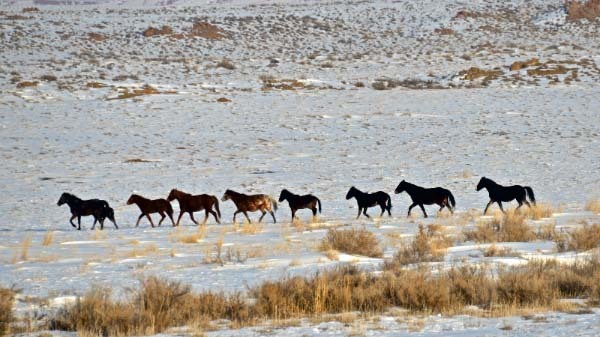 There had once been wild horses in the area, but I thought the Bureau of Land Management (BLM), the agency charged with preserving our wild horses, had removed them long ago. 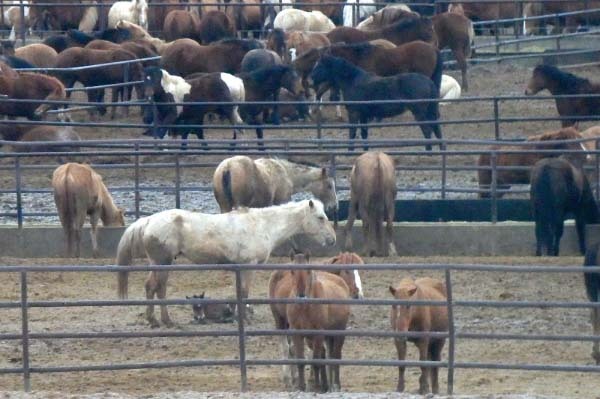 Over 150 times BLM has chosen to “zero out” herds for various reasons, even though the horses were designated for management under the 1971 Wild Horse and Burro Act. In the shadows of the stunted cottonwoods I noticed a shimmer of light. There was at least one small pond back in there. I snapped a picture of the tranquil scene and looked through my binoculars again. In the distance there was movement. It was another, smaller band trailing across a rise with Sheep Mountain in the background. The bright sorrel coats of the smaller band shone in the late afternoon light. The lead mare had a small foal at her side. What a stark and beautiful landscape. Beyond were the flat-topped Bighorn Mountains still sporting patches of snow. How exciting, I thought—a secret herd of lost mustangs. In my mind, I imagined bringing Trace up from Colorado and riding him in search of the herd. We’d have to take lots of water, but what an adventure it would be. I noted several roads that led from the paved highway toward Sheep Mountain where I would take the trailer and park. In retrospect I wish I had done this sooner rather than later. Over the next nine months, each time I traveled to and from the Pryors I looked for them. Two bachelor stallions were easy to spot in November as I traveled toward Greybull from Lovell. These two would be the closest I ever got to the lost herd. What a flashy pair. The sorrel had a bald face. I was sure he had a blue eye on the side of his head that was white. He had tall stockings. The black had two back shorter stockings and a pretty star and snip. I saw the big band, led by the blaze-faced black stallion in February and in March. On March 8th when Paula King, our Communications Director, her husband, Ron, and I traveled back from the Pryors, we spotted them. There were two new foals in the band, one black and one sorrel. 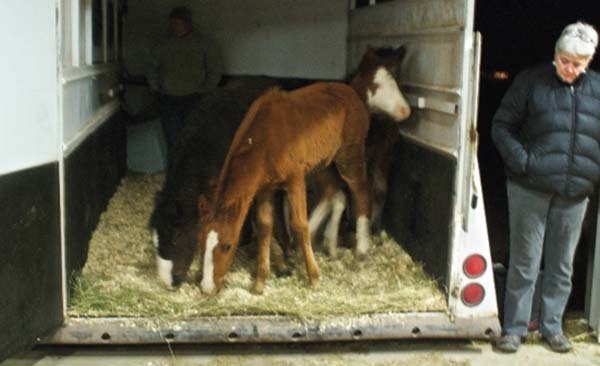 I never dreamed that the next time I would see these foals I would be loading them into my trailer. On March 25th, our Facebook Manager and Board Member, Linda Hanick, called me. She has a message on our Cloud the Stallion FB page. A person wishing to remain anonymous said that a crowded truckload of mustangs had crossed over the Wyoming border into Montana. The informant said the truck driver was bound for Shelby, MT. When Linda said the word Shelby, my heart dropped. Shelby is the place where horses are held before being transported over the border to Canada and the Alberta slaughterhouse. The informant said the horses were healthy and fat and “fresh,” meaning they had just been caught. They had come from the Worland Livestock Auction and were going to quarantine in Shelby for 30 days. Our investigation began. Linda called the State Director of the BLM in Cheyenne who said that 31 horses had been “gathered” with a helicopter near Greybull, but they were not wild. They were domestic horses that got loose or were turned out 40 years ago. They could only be the secret herd! I got the number for the Bar S Feedlot in Shelby and called. A woman answered the phone. "I'd like to buy the 37 wild horses that were captured in Wyoming on March 18th and 19th," I said. “That’s not possible,” she responded curtly. “We don’t sell horses to individuals.” I told her I represented an organization and that I would pay much more than the going slaughter rate. She was abrupt. “These horses were rounded up and removed for slaughter, and that’s where they’re going.” The finality of her words was chilling. “Can you at least tell me if they reached you safely?” I asked. “I won’t tell you anything,” she answered and hung up. For the first time I was staring horse slaughter squarely in the face. Suddenly the anonymous thousands that go to slaughter across our borders had faces. Friends went to Shelby and photographed the pens and I tried unsuccessfully to match up the pictures of the pathetic horses (some mares with newborn foals) with those I had grown to love in the wild. Paula called the Brand Inspector, the BLM in Cody, the Worland Office of BLM, and the Bighorn County Sheriff’s Department. BLM said they captured 41 “estray” horses and turned them over to the Wyoming Livestock Board who hauled them to the Worland Livestock Auction. They in turn sold them to a kill buyer for a Canadian slaughterhouse. The Brand Inspector confirmed that 37 were shipped. 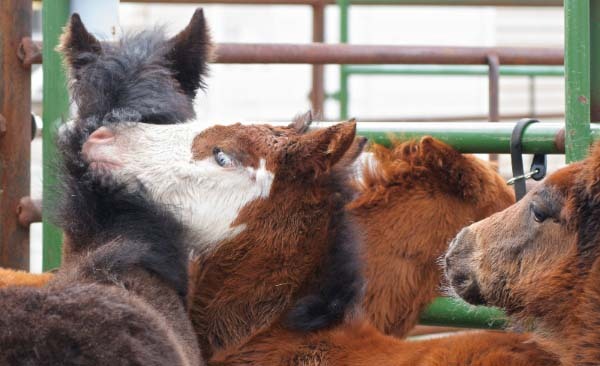 Four small foals were left behind because the manager of the Worland Livestock Auction, where the horses had been taken, demanded that they not put the foals on the truck. For this act of kindness, we will all be eternally grateful. The BLM Public Information Officer (PIO) echoed the State BLM Director. The horses were not wild, she insisted, and claimed they were removed because they were a hazard and there had been complaints. She said a horse had been hit by a Bentonite Truck and damaged the truck. The Sheriff checked his records and could not find the incident. Next she said a horse had been hit by a train. The Sheriff had no record of that either and was upset that a helicopter had been flying in his county, rounding up horses without his knowledge. Further digging by Paula found that there were, in fact, two incidences—one five years ago and the other 8 years ago. Why would accidents that happened so long ago precipitate an action like this at the very time the horses are most vulnerable, when there are tiny foals and heavily pregnant mares? Later we got our answer. Foals captured on March 18th. When in doubt, follow the Money. A BLM budget existed for a helicopter removal. That money would not be available to BLM after the end of March. It would have to be used or turned back into the government coffers according to a BLM employee in Cody. As for the complaints received by BLM? They would not confirm that any had been in writing. According to the PIO, the complaints came from people who dropped by the BLM office, or those who spoke with her while shopping at the grocery store. Over and over the BLM said the horses were not wild and had no protections under the Wild Horse and Burro Act. They were rodeo stock let go on the range 40 years ago and the former owner had died. I recognized the name. His family reputedly stole horses off the wild horses ranges to supply their bucking horse business. How ironic, I thought. Horses stolen from the wild, turned into bucking stock, and released back to the wild weren’t wild according to the BLM. 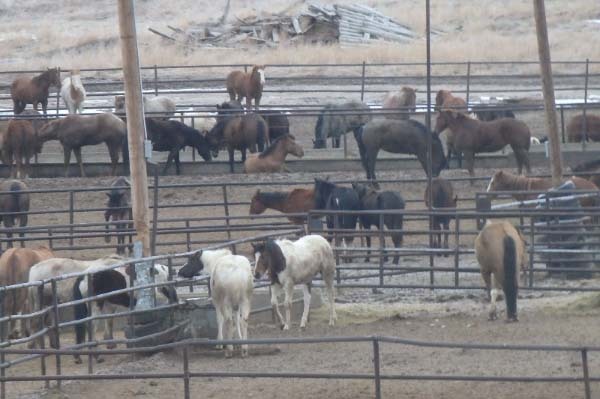 On March 19th, just hours after the last five were captured the BLM turned all 41 horses over to the Wyoming State Livestock Board who sold them to a kill buyer for a Canadian slaughterhouse. Within hours the horses were on their way to Shelby. On Sunday I flew back to Colorado from a conference in Massachusetts while my dear friend and TCF Board Member, Ann Evans, drove my trailer from Westcliffe, Colorado to Dr. Lisa Jacobson’s home and vet facility in Berthoud, Colorado. We met at Lisa’s that evening. Lisa had excitedly agreed to care for the four little foals. Early the next morning Ann and I started driving north to Worland, Wyoming, a seven hour trip. Wind gusts 50 mph and even stiffer eventually combined with ice-packed roads and we nearly turned back at Douglas, Wyoming, but kept going when we sensed the worst weather was behind us. We arrived at the Worland Livestock Yard in the early afternoon. Kim Michels, our friend from Red Lodge, Montana was already there. 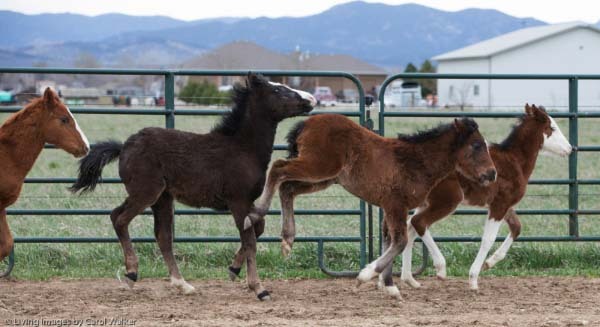 Kim had negotiated the purchase of the foals before we even knew that “Dr. Lisa” would take them in. In short order, a quiet cowboy helped us load the tiny foals. The oldest foal, the one we eventually named Allegro sniffed the back of the trailer. Then she jumped in with the tiniest, the one we named Piccolo, glured to her side. Allegro immediately went to the back of the trailer and started biting on the padded wall. Ann and Kim prepared some formula for them which they divided into two buckets that we secured in the back. Within an hour we were on our way with our precious cargo. Seven hours later we arrived and unloaded at Dr. Lisa’s place. The foals calmly hopped out and eventually found their stall piled high with soft shavings and buckets of milk replacer hanging on the wall. The next morning I got up and walked to the barn. A meadowlark, perched on a fence post, was singing. The air was crisp but the sun was warm. I found the four foals outside in the sunshine and looking around. Lisa’s old mare, Dusty, greeted them. 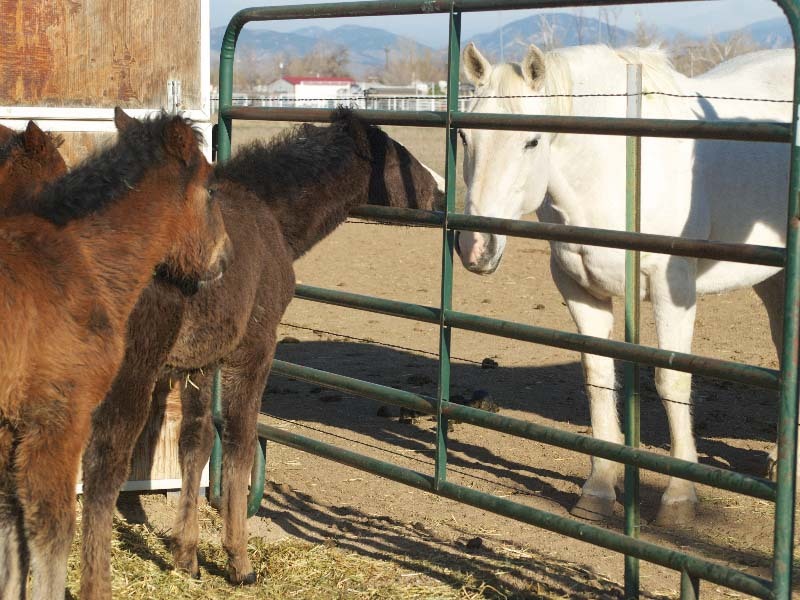 The foals had lost their mothers and gravitated to the old mare, as if searching for their families. While there might not have been anything illegal with the capture and sale of these lovely, wild animals, the act was unthinkably cruel, immoral, and completely unnecessary. Advocates would have purchased the entire herd had we only known. So here they are, our four, sweet leftovers (the three photos to the right are courtesy of Carol Walker). They are flourishing under the care of the remarkable “Dr. Lisa” who gives them their freedom in the arena they call the “big running place.” They have lots to eat and domestic mares who try to keep them in line and teach them what their parents would have reinforced each and every day. I wonder if they will always remember where they came from, and the life they lost forever in one fleeting moment when the monster in the sky came and drove them into a trap and took their families away. We have named them the Dry Creek Quartet for their herd area that had been zeroed out 27 years ago. The blue-eyed filly is a flashy little paint who reminds me of the handsome sorrel bachelor I photographed last year. I wonder if he was her big brother? Piccolo’s resilience, her ability to survive this holocaust at such a tender age, is extraordinary. They are our band of orphans—the Dry Creek Quartet. We are working very hard to make sure this tragedy never repeats itself. And we smile everyday as “Dr. Lisa” relates the progress the foals are making. Sadness fades, over shadowed by joy and love. P.S. If you want to support the Quartet, please consider making a donation today.